Your hands may give away your true age. Often there are hereditary or genetic factors that can contribute to volume loss, prominent veins and tendons but environmental factors are also significant. Sun exposure causes pigmentation problems, age spots and wrinkling. At the Summit, we offer a variety and combination of treatments that can rejuvenate aging hands by restoring volume and reduce the effects of the sun. “Restoring volume in the hands is so easy and if you combine that with a chemical peel, you can really make a profound difference,” says Dr. Ricciardelli. Dr. Ricciardelli has over 25 years of experience injecting fillers and keenly aware of what is crucial in achieving a natural look. Dr. Ricciardelli has been named an Expert Injector by New Beauty Magazine. How do these fillers work? Dermal fillers injected into the top of the hands replace volume and can disguise protruding veins and tendons. Radiesse is the most popular filler used for volume replacement. There are a variety of peels to choose from to reduce the sun spots and wrinkling. We recommend that the injections are done before the peel. The chemical peel will create shrink wrap effect on the skin over the filler for a very nice result. How do I know what filler will work best for me? Dr. Ricciardelli will examine your hands, paying particular attention to the degree of fullness present, the laxity of the skin in the area, and protruding veins and tendons. There is a lot to consider when injecting in this area. Radiesse and Sculptra are the fillers most often used will little to no discomfort or downtime. At your consultation, Dr. Ricciardelli will discuss which filler will best meet your goals. Your goals and expectations will be discussed thoroughly at your consultation. One to two weeks before your injection, Dr. Ricciardelli may recommend stopping aspirin, St. John’s Wort, high doses of vitamin E or blood thinners to minimize your risk of bruising. A medical grade skincare regime for before and after your procedure will enhance the overall improvement. Feel free to bring a list of questions or photos. We love an informed patient. 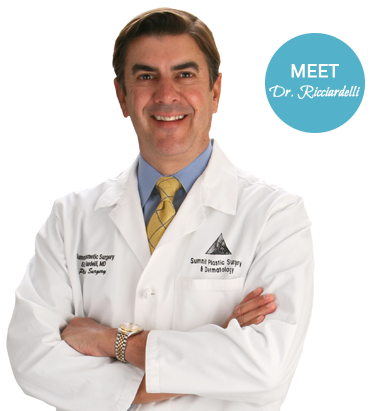 Dr. Ricciardelli will let you know what to expect before, during and after your procedure and answer all of your questions. This procedure is quick and simple and is performed with a very an ultra-fine needle. At the Summit, we take great care to insure your comfort during the procedure. You will be given an instruction sheet for your specific needs and small ice packets to apply after treatment. Arnica Montana can speed up the healing process and is available if you are someone who bruises easily. Expect the treatment to last 12-18 months in most cases. Our door is always open for any questions. It’s about confidence: confidence in your injector, confidence that your wishes and individual concerns will be heard, and confidence you will get the results you want. Dr Ricciardelli has the experience and reputation that ensures a known track record in the area and the qualifications and certifications that recognize him on a regional and national level. He has performed more injections than any other plastic surgeon in the area.